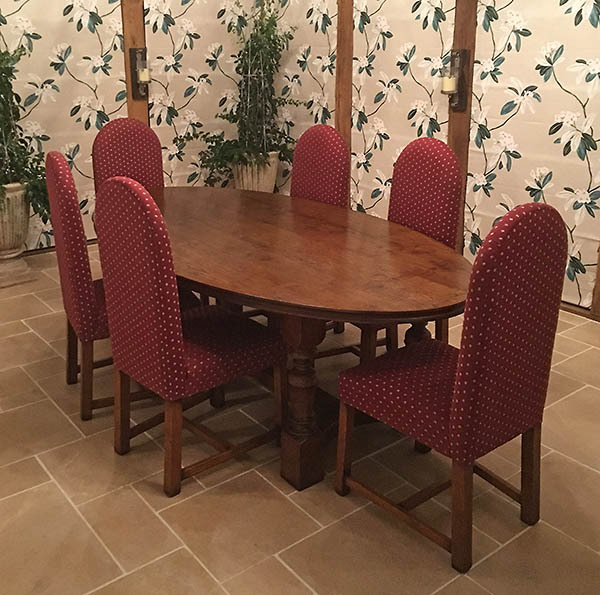 Photo kindly sent in by our client in Surrey, shows our Wilmington bespoke range oak refectory table, with moulded edge and exposed dovetail joints to the oval top, together with attractive and practical curved end stretchers. The link below takes you to our product page showing an elm top. In this case, our client chose an oak top (at less cost and easier availability), with identical coloured dovetail joints. The other link takes you to our bespoke arch top chairs, but our client was happy for us to modify our similar Berwick range semi-bespoke side chairs, again, at a much reduced cost. Here is the link to the Berwick traditionally styled fully upholstered chairs. Please contact us for a quote to make the modification to the back.